Excited to see v7 of WebStorm has been released but running check updates from within v6 does not find v7. Is this expected behaviour? I'm nervous about downloading v7 manually as I don't want to lose settings or effect licence. Each major version stores settings and plugins in separate folders. On first launch you will be asked you to import your settings from previous version regardless of upgrade path (automatic or manual). This means that you can run 2 different versions in parallel if required/desired. 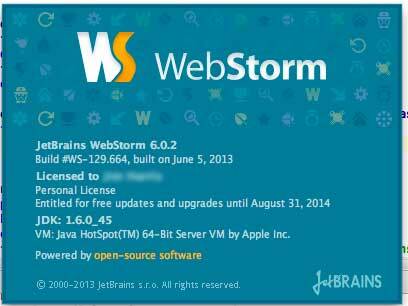 WebStrom 7.0 is a free update for everyone who purchased their licence after September 26, 2012. I may be mistaken here, but AFAIK there is no automatic update between major versions -- you have to download new version manually, hence such message.